When I first encountered this film, it was the poster for it that attracted my attention. Then the title surprised me. Doesn’t it just mean that someone is knocking at the door? How could anyone shoot a film concerning knocking at the door? I guess the door is certainly not an ordinary door. Out of curiosity, I watched this film. The film opens with the Lord Jesus’ words, “And at midnight there was a cry made, Behold, the bridegroom comes; go you out to meet him” (Mat 25:6). Next, a hand-drawn picture of the Lord Jesus knocking at the door at midnight meets my eye, which visually expresses the meaning of the verse and the mystery of “knocking at the door”. In the early morning, Yang Aiguang reads the following verse when practicing spiritual devotion, “Behold, I stand at the door, and knock: if any man hear my voice, and open the door, I will come in to him, and will sup with him, and he with me” (Rev 3:20). Pondering the verse, the heroine can’t help but ask, “How will the Lord knock? And in what way will He knock?” These words reflect the heart voice of all Christians who thirst for the appearance of the Lord. Like millions of Christians, Yang Aiguang has been eagerly expecting the return of the Lord Jesus. However, when people knock at her door and bear witness to the Lord Jesus’ return, even though she is moved deeply by those words they read to her and recognizes that those words come from the revelation of the Holy Spirit yet she shuts the door on the witnesses time and again. Why is this? Yang Aiguang says, “The Lord has appeared somewhere to work? It’s impossible! The Lord will descend with great glory upon clouds in the last days, and all people will be able to see Him. This came from the Lord Jesus’s own mouth. Now, we haven’t seen the Lord descend on clouds. How could you say that the Lord has returned?” This is one of the locks of the door of her heart. These words pastors frequently preach have been maintained for decades. But are they right? 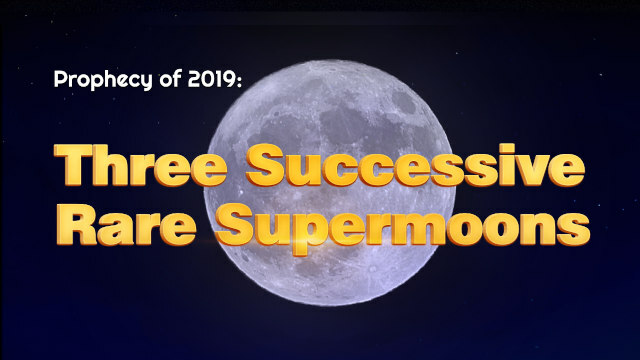 In the Bible there are many other prophecies about the Lord’s reappearance. For example, Revelation 3:3 says, “If therefore you shall not watch, I will come on you as a thief, and you shall not know what hour I will come on you.” If the Lord descends on clouds when He returns in the last days, then how should we explain the prophecy “as a thief,” and how will it be fulfilled? Through the witnesses fellowshipping with her patiently, Yang Aiguang’s confusion is solved, and she recognizes that those words the witnesses read to her come from the revelation of the Holy Spirit. At this point, there is a twist in the plot. When the witness reads the words of God being incarnated into the world again, another lock of the door of her heart emerges. As the plot unfolds at the bank of the river, the outcome is known. The Lord Jesus said, “For as the lightning comes out of the east, and shines even to the west; so shall also the coming of the Son of man be” (Mat 24:27). “For as the lightning, that lightens out of the one part under heaven, shines to the other part under heaven; so shall also the Son of man be in his day. But first must he suffer many things, and be rejected of this generation” (Luk 17:24-25). It turns out that the mystery of God’s second incarnation lies here. We have read these verses quite a few times but never paid attention to them at all. Is “the coming of the Son of man” not a direct counterattack against the fallacy? The witness’ trenchant questions surprise Yang Aiguang, and also make her have more doubts in her heart. Thus, she has to face these questions. However, when she hears God’s words that expose the pastors and elders’ manifestation of resisting God, the other lock of the door of her heart emerges. She says, “Pastors and elders are appointed by God, so most of them should be after His will.” Because of worshiping the pastors and elders, she believes how could nobody understand the purpose of God’s work and know God among so many pastors and elders. She fails to accept the fact and asks the witnesses to leave again. But it is just that this time her husband and daughter no longer agree with her opinion. All discerning people can see the actions of the pastors and elders clearly. How could pastors and elders be appointed by God? Her husband and daughter’s words make her start to reflect. Carrying doubts and confusion, she visits the pastor once more. Obviously, the pastor’s answers do not solve her confusions. That night the pastor’s words and the witnesses’ keep floating into her mind. Who is right? What should I do? She tosses and turns all night, unable to fall asleep. In helplessness, she can only pray to the Lord earnestly. And she is expecting another knock at her door. The Lord heard her prayer. 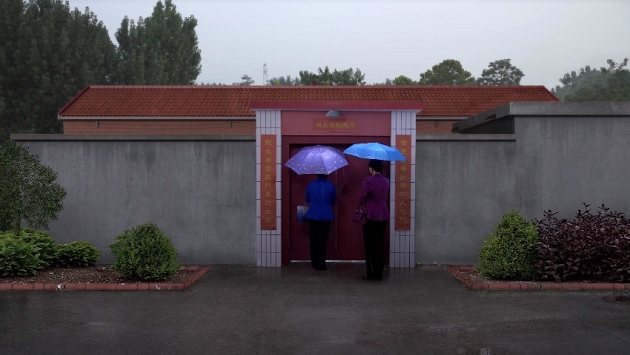 On a raining day, the witnesses, Li Mingzhen and Fang Min, knock at her door once again. But why on a raining day? What special meaning does it imply? Later, after consulting with some Christian friends from Mainland China who just came to Greece, I got to know the deep meaning that the writer-director wanted to tell us through this special scene. It signifies that it is relatively safe to preach the gospel on rainy days. 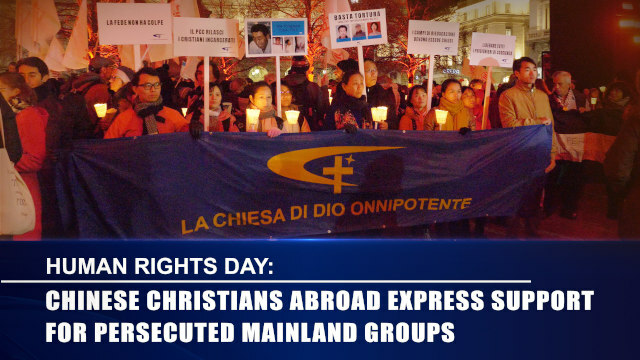 For in China the CCP’s informers, who monitor Christians, are everywhere and they should be unwilling to go out on rainy days. Also, it signifies that witnesses have determination and perseverance to face the difficulties of preaching the gospel. The scene is based on the real experiences of Christians in Mainland China. In the following plot, there is a further twist. Yang Aiguang, who asked Li Mingzhen and Fang Min to leave her house on the last occasion, receives them warmly on that day. She says excitedly, “We’re expecting you to come to fellowship Almighty God’s words with us!” The witnesses are surprised at the change in her attitude toward them. Meanwhile, they have again experienced the true meaning of the Lord’s words “My sheep hear my voice.” By their patiently fellowshipping with her and continually reading Almighty God’s words to her, Yang Aiguang finally opens the door of her heart. From Almighty God’s words, she sees that she is too arrogant: Having believed in the Lord for years, she doesn’t understand that God’s words are an endless stream and they are boundless. Instead, she obeys the pastors and elders’ words and delimits God’s work and words as being in the Bible, believing He could only say those limited words in the Bible and will never again utter words. That is delimiting and blaspheming God. At that time, the three locks of the door of her heart are all opened. She is no longer deceived or bound by the religious concepts and heresies and lies the pastors spread. In the churches that Yang Aiguang leads, believers are very zealous and most of them are people who truly believe in God. They all often contribute money. The income of Pastor Jia mainly relies on those churches. Once Yang Aiguang accepts Almighty God, Pastor Jia won’t be able to keep those churches. He has a clear picture in his heart regarding it. Not only does Yang Aiguang believe in Almighty God, but she also takes believers to look into His work—this is what Pastor Jia can by no means allow to happen. Flustered and exasperated, he knocks on the door of Yang Aiguang. At that moment, the film works up to a climax. 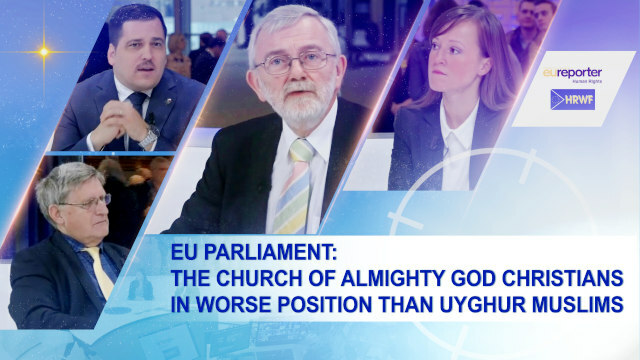 In the house of Yang Aiguang, there is a heated debate during which Pastor Jia is refuted down to the last point by the frank and forceful words of the brother and sisters. Later, Pastor Jia calls the police to arrest the witnesses, which reveals his evil deeds of cooperating with the CCP government to arrest Christians. Immediately the witnesses escape at night, the CCP police break in. Afterward, believers, in the harsh environment, still persist in seeking and investigating the true way. With many people standing guard outside, believers and the witnesses gather together somewhere again. In the meeting, Almighty God’s words open the door of their heart, and they joyfully welcome the returned Savior. I’m dazzled by these good plots. John 10:27 says, “My sheep hear my voice, and I know them, and they follow me.” I have pray-read the words of the Lord many times, and pondered them night and day. The verse also has been puzzling every believer for many years who has been expecting the returned Savior. Until today, the film “Knocking at the Door” reveals the mystery of the verse. Thus believers who have been eagerly expecting the returned Savior recognize the shepherd’s voice and cannot help shedding tears. The doors of their hearts are finally opened, and so they welcome the Groom and attend the feast with Him. In the end of the film, accompanied by a rousing hymn, Yang Aiguang joins the ranks of those gospel preachers knocking at the door. Whether it is bitter cold or scorching hot, they insist on going door-to-door knocking. We can hear a clear knock, knock, knock, knock after knock … If it were you, how would you respond to the knock at your door? By Zhu Dan, Finland The movie Red Re-education at Home has “red education” with Chinese characteristics as a subject, and has attracted many people’s attention. Red is the special color to stand for the CCP. Since the CCP took power, red dictatorial rule, red education, red thoughts and so on..
Film Review: An Analysis of the Characters in Who’s Nailing God to the Cross Again? The title of this film—Who’s Nailing God to the Cross Again—is distinctive. It is an interrogative sentence. Generally, very few films are named as a sentence, especially an interrogative one.